The Titanium solution is ideal for officials associations that want maximize their organization’s performance while fully protecting both their organization and individual members. Association insurances are available with only with SHIELD. General liability insurance protection — Coverage included for the association as an entity and its board and its board and committee members for coverage up to $1 million per occurrence and $5 aggregate. General liability provides coverage for claims for bodily injury, property damage and personal injury. $50,000 Game Call and Assigners Coverage Errors and Omissions Protection — Provides coverage for alleged officiating-related errors and omissions that result in a claimed financial loss but there is no bodily injury. General Liability Insurance Protection — Coverage for up to $6 million per occurrence. This provides excess coverage for claims for bodily injury, property damage, and personal injury during sporting activities that are organized by recognized sports organizations while officiating, assigning or attending camps, clinics and meetings. Game Call and Assignors Protection — Coverage extends to $100,000 per occurrence. Provides for claims alleging an error on the court or field or for a decision that you made as an assigner. Assault Protection Program — Provides up to $15,500 coverage for certain expenses and loss of game fees resulting from injuries suffered when an official is the victim of an assault and/or battery by a spectator, fan or participant while the official is performing officiating duties at an organized sporting event. Takeaway: Necessary insurance coverage to protect your association for activities, camps, clinics and training. Pair that with the premier individual insurance protections provided to your members through NASO and your association is fully protected. Liability Protection — Every member receives insurance protection for personal injury liability, game call and assigners liability and assault protection. Referee Magazine — 82 pages of rules, mechanics, caseplays, quizzes, features and news delivered directly to your officials monthly. It’s Official — 12 ADDITIONAL pages of officiating training and membership news delivered with Referee magazine exclusively for NASO members. NASO LockerRoom Digital Newsletter — Bi-Weekly officiating news, articles, resources, tips and contests delivered electronically to your members. MICP (Members Information & Consultation Program) —Provides financial, tax, legal and administrative general information and consultation to every single NASO member. Marriott Athletic VIP Card — Every NASO member receives access to this exclusive Marriott athletic program normally reserved for pro and college players and coaches, offering discounts of up to 25% at participating Marriott family hotels. Exclusive Savings — On Referee books and DVDs, NASO Summit registration and rental cars. Takeaway: The most comprehensive and premiere officiating membership organization in the country that will advocate for, educate and protect your association. All options require separate enrollment to purchase. » Directors & Officers coverage option can be thought of as malpractice insurance for the association and those who manage it. It protects the association as an entity and the board members against claims for allegations of wrongful acts, errors, and omissions. » Game Fee – Excess Accident Medical coverage option provides protection against lost games and injuries that result from officiating activities. » Crime coverage option protects the association from dishonest acts of employees and volunteers including theft, forgery and fraud resulting in financial loss to the association. » Cyber coverage option provides liability protection for an association in the event of a breach of personal identifying or confidential information. Enrollment into the Association Advantage Program provides your group’s leadership and board of directors with the only package of tools and resources in the world specifically dedicated to providing education and training for running and improving local officials associations. Advantage Guidebook to Association Management — A comprehensive manual considered the “Bible” of officials association leadership and administration, delivered directly to your association’s designated key contact person. Advisor newsletter — 12 monthly issues full of news, features, tips and best practices on such topics as assigning, evaluations, recruitment & retention, meetings, bylaws, contracts, discipline, insurance and legal topics all related to running an officiating organization. Click Digital Newsletter — Delivered electronically to all of your association members with links to association-specific articles, news and tips for better running your officials group. Members-Only Website — Unlimited access to the Association Advantage members-only website featuring the largest and most comprehensive online database of officials association resources and articles. Training Incentive Program — Bulk-buying opportunities for officials training resources with discounts of 45% off. 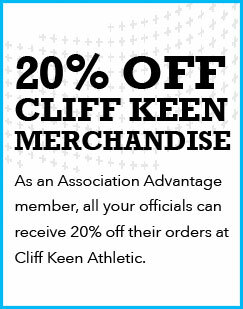 Major Cliff Keen Discount — Your entire association membership receives an exclusive 20% discount on all online purchases from Cliff Keen Athletic, the official sponsor of Association Advantage. MICP (Members Information & Consultation Program) — Provides financial, tax, legal and administrative general information and consultation on issues pertaining to your association. Takeaway: Vital information nobody else provides on maintaining and running your association.